China's GDP will grow to more than twice its size today, helping the Asian powerhouse to almost entirely close its gap with the U.S.
India, ranked eighth for 2015, will climb past Brazil, the United Kingdom, France, Germany and Japan to take third place in the world ranking. The International Monetary Fund calls India "the bright spot in the global landscape." The country will have the largest workforce in the world within the next 15 years, the IMF notes, and among the youngest. Japan is "an important lesson in how quickly you can downshift your status of what a structure of an economy delivers," said Bruce Kasman, JPMorgan's chief economist. France will slide three spots, while Italy drops two. In the overall ranking, Jamaica will surrender the most ground, bumping down 13 places to 136. Countries with the biggest advances -- like Uganda, which will climb 18 spots to rank 91 -- are concentrated in Africa, Asia and the Middle East. It's important to take estimates stretching out so far with a note of caution, though. "There are lots of uncertainties," said Kasman. "Whether China grows at 4 percent or 6 percent matters an awful lot for where it looks like it's going to be in the global economy. Whether India grows at 3 percent or 8 percent -- these are huge differences when you compound them over long periods of time." 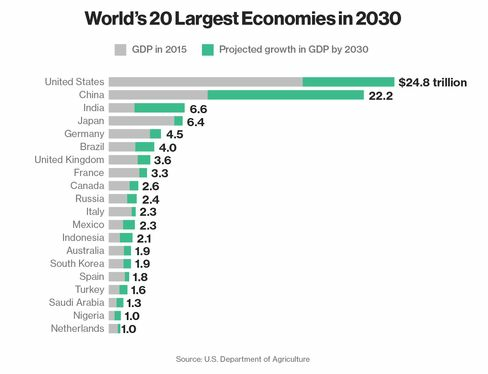 The USDA is not the only -- and hardly the most widely-followed -- ranking of global economic growth, though it does offer the advantage of particularly long-term outlooks. The International Monetary Fund's economic outlook only projects out two years. Look out for it later this month. And if 15 years is too far out for you, take a look at the fastest-growing economies just for this year.